Unlike Mac or Linux, the file extension is very important in Windows. The extension of a file indicates the content type and which program should be used to open that file. But sometimes we stumble upon files without any extension and we don’t know what to do with them. If you try to double-click on a file without any extension, Windows would just throw up an error that ‘No program is associated with this file type‘. But using an open-source program called TrID we can find out the file types of such files and then look for a program that can open it. TrID scans the files based on signatures and can successfully predict the file types based on the data contained inside a file without having to depend on the file extension. TrID is an open source program but it is has only a command line interface (CLI). If you are not comfortable with a command line interface, then you can download a GUI designed for it called TrIDNET (the NET part means that this software was programmed in Microsoft .NET). 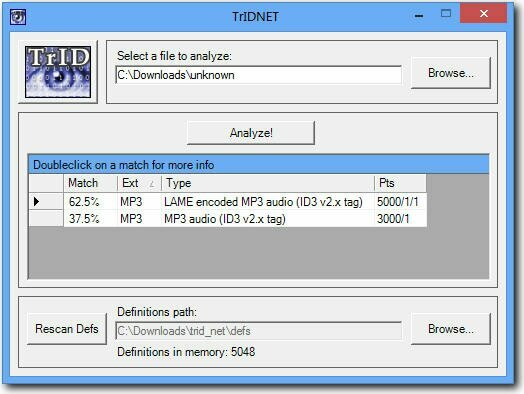 You have to download the TrIDNET program and the definition files separately, extract their contents to the same folder and then run the TrIDNet.exe from there. Then all you have to do is click on the Browse button and select the file, content type of which you want to determine. The file would be analyzed immediately without any delay and the results would be displayed. The results are displayed in form of the probability. The percentage is higher if the probability of the file to be of a certain type is higher. For example, I selected a file without any extension and TrIDNET showed that the probability of its being LAME encoded MP3 file is 62.5%, while that of its being MP3 audio is 37.5%. The suggested extension in both cases is MP3. So now I can rename this file to be an MP3 file and try playing it in a media player like Windows Media Player. But sometimes, the suggested extensions are not something that we can open with an installed program. If you do not know which program can be used to open a file extension, then you can either google that extension or you can visit the openwith.org website to search for that extension and find the programs that can open it.